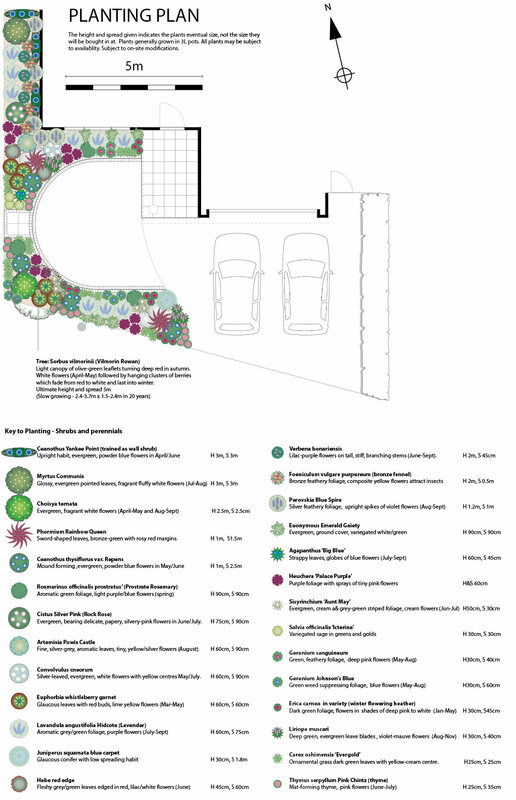 A planting plan is a drawing that specifies the plants that will be put into your garden. It shows the position, variety and quantity of plants for any given area. Each plant has its own carefully created symbol and each symbol is listed in a key alongside the plant’s Latin name and a concise description. The planting plan for your garden will ensure that the garden is packed with year round colour and interest. Plants are carefully selected to create the right look and feel to complement the hard landscaping. Our expert designers will ensure you have the right plant for the right place and tailor the scheme to your level of expertise and the amount of time available to maintain the garden. Our planting plans are usually based on a 3-5 year maturity scheme which provides a good balance between creating an instant impact on a sensible budget whilst providing room for plants to grow. You can use the key to help access the wealth of information that is available online to help you care for your garden as it matures. Type the latin name of a plant into a search engine to find helpful plant care advice from the RHS etc. ← What Is An Outline Plan?